Goodman believes that your local HVAC (Heating, Ventilation and Air Conditioning) professional knows best about your specific indoor comfort needs and indoor air quality solutions. When they recommend a Goodman brand product, rest assured that you and your family will soon be receiving great indoor comfort, at a refreshingly affordable price. For over three decades, the Goodman® brand has concentrated on something more important than simple brand-recognition consumer advertising. Since 1982, Goodman focused on helping millions and millions of homeowners achieve reliable, high-quality and affordable indoor comfort with products that continue to be designed, engineered and assembled in the U.S.A. As a result, the Goodman brand has earned the loyalty and respect from thousands of local independent heating and cooling professionals across North America. Goodman continues to invest in research, reliability testing, and state-of-the-art manufacturing equipment to provide you with the highest-quality products for years to come. Want to know even more about the quality policies, procedures, and process that Goodman has in place so you get the most comfortable indoor environment possible. Goodman says it had the industry’s only dual-diameter, tubular gas furnace heat exchanger, with a unique design that brings new meaning to durability. 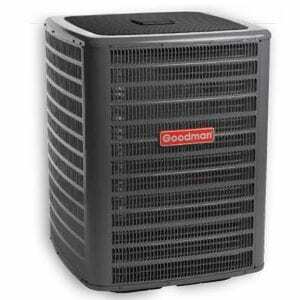 Goodman offers high-efficiency air conditioners and heat pumps with the Goodman brand’s patented SmartCoil™ condensing coil – the most advanced and efficient 5mm copper tube and aluminum fin combination available. ComfortNet™ Communicating Control systems that help high-efficiency systems run their absolute best and offer homeowners new levels of control and operational precision.